There is actual, interesting physics behind how cats drink water. At a glance, it might appear that all they do is use their tongues as cups to get water into their mouths. According to an article on Cat Channel, though, that’s not what they do at all. Instead, they use the tips of their tongues to create a column of water to pull into their mouths. Cats’ ability to drink water from a horizontal surface, such as a bowl, a puddle, a pond, or whatever else they may find in the wild, hinges on their tongues, and on water surface tension and liquid adhesion. Joanne McGonagle, the writer of the article on Cat Channel, says that Dr. Roman Stocker of MIT decided to investigate the physics behind how cats drink water after watching his own cat drink several years ago. 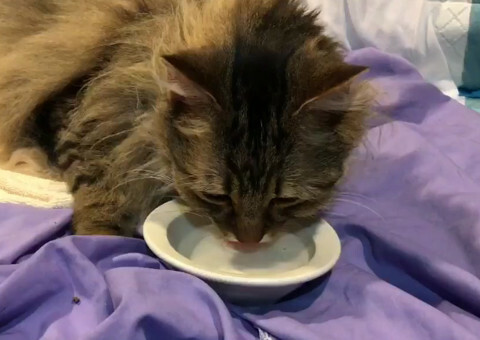 What Dr. Stocker found is that cats curl the tips of their tongues very sharply downward when they drink, instead of making a cup and scooping the water into their mouths. They very lightly touch the surface of the water, without piercing it, with the smooth tongue tip. The water sticks to the tongue, forming the column from which they then drink. According to a 2010 article in MIT News, cats instinctively know exactly when gravity will overcome the surface tension of the water and bring the column back down into the bowl, and they close their mouths around the water column to get their drinks. This is also how they keep their chins dry (or mostly dry) while drinking. The physics behind how cats drink water results in about four laps per second for our furry feline friends at home. Bigger cats, which have correspondingly bigger tongues, lap more slowly, because more water sticks to the bigger surface area of their tongues. The way cats drink water is different from how dogs drink water. Dogs actually do make little ladles out of their tongues to scoop water out of a bowl, according to the Washington Post. The researchers who began the study at MIT actually did so out of curiosity more than anything. The physics behind how cats drink water boils down to this: They have learned to balance gravity against inertia. Alaways kitties were unique and smarter than dogs.